ever since i saw the comedians in cars getting coffee episode with gad elmaleh, i've wanted to go to pommes frites ... a french fry only snack stop in the east village. i mean, come on. obviously. some more deets : "pommes frites isn't an ordinary shop, but a specialty shop serving authentic belgian fries ... you won't find many seats here, but you will find the tastiest treat in town." damn straight. sauces : sambal olek (hot chili paste) & regular ol' ketchup. everything i wanted a more. delicious. fresh. crispy. hot & steaming. french fry amazingness. there were a couple other vegan dips, but i felt like i had to get the ketchup (the o.g. of fry condiments) ... but i went a little wild with the uber-spicy sambal olek. top notch. wind swept hair & a french fry bouquet. after a day walking around in the wind, i (my hair) was quite um... yea, you see. but that didn't stop me from taking a photo with my bouquet of fries. 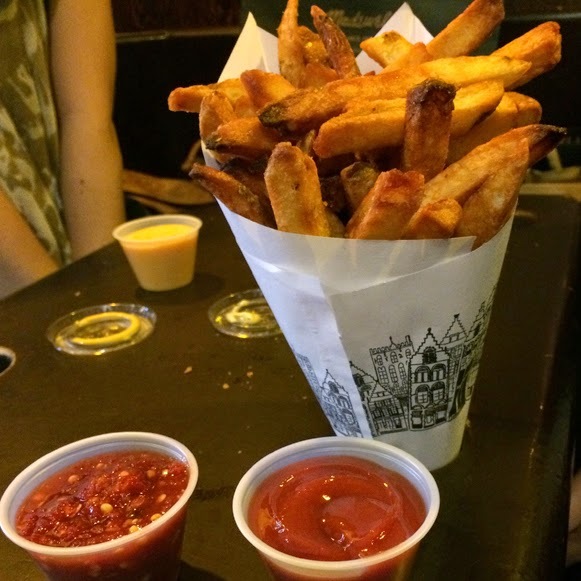 i really believe pommes frites is a must stop shop in nyc ... perfect for a late afternoon snack. bon appétit!